Natalie Thompson wakes up in a basement without any memory of how she got there. With her memories a blur, she feels alone in a seemingly abandoned and very strange town. Within this town, creatures who can get a glimpse of human life through a portal are no longer content with their undead status. With the works of a government conspiracy and a few megalomaniac scientists, the portals are expanding. Now these creatures are threatening our civilization, and our world is on the brink of destruction. Can Natalie control the artificial intelligence chip and regain her memory in time before all of humanity is lost? 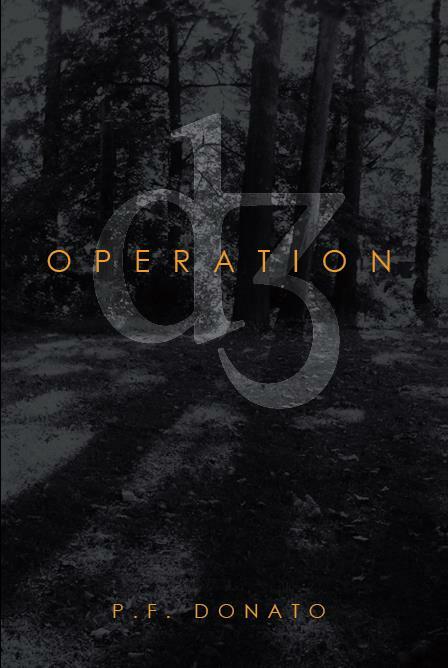 If you’re into Science Fiction - Apocalyptic - Military - Horror - Thriller - Suspense - Action - Adventure - Fantasy novels than you’ll love Operation D3!! Sold at Amazon.com, Barnes & Noble, Google play, Apple iTunes, or order through an independent bookstore near you. Check out Operation ʤ Reviews Below OR Go To www.facebook.com/PFDonato for more information. “I’ve greatly enjoyed working on Operation d3. It’s an interesting story, with a lot of action and twists, and the characters are well drawn. You do a good job blending science fiction and action, keeping things moving fast while throwing mind-warping theoretical concepts at the reader in a way that makes them seem entertaining rather than baffling. The dimensional portals, and particularly the way you explain that an entire dimension can be sucked into another dimension, give the reader a lot to think about. Natalie is a compelling lead character, and the villains are all generally well-written and interesting.